Markets are fine, volatility is modest and trade war isn’t a big deal, say delegates at junk-bond king Michael Milken’s annual L.A. summit. In other words, the freewheeling spirit Milken once embodied is back in vogue. Thank President Trump – and a dose of complacency. 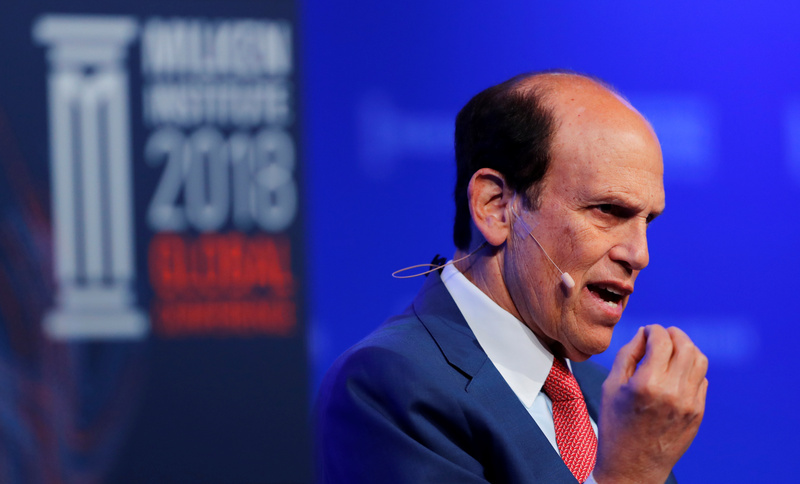 Michael Milken Chairman, Milken Institute speaks on health care at the Milken Institute 21st Global Conference in Beverly Hills, California, U.S., April 30, 2018. The Milken Institute is hosting its annual Global Conference in Los Angeles from April 29 to May 2. The event, held at the Beverly Hilton hotel and hosted by financier-turned-philanthropist Michael Milken, is in its 21st year. As a banker at Drexel Burnham Lambert in the 1980s, Milken pioneered the use of junk bonds to finance companies and hostile takeovers. Drexel was forced into bankruptcy in 1990, a year after pleading guilty to a series of illegal activities. Milken, who in 1990 pleaded guilty to six counts of securities fraud and tax evasion, served two years in jail, paid a total of $1.1 billion in fines and legal settlements and was barred for life from the securities industry.